Posted by Rhett Mcdaniel on Monday, August 13, 2018 in Events, News. Two Center for Teaching programs for graduate students and postdocs are now taking registrations for the fall. Each program consists of a seminar and a practicum, and each lasts two semesters. The first program is the Certificate in College Teaching (CiCT). This program focuses on the research on how people learn as well as best teaching practices, preparing participants for future teaching roles in the academy. 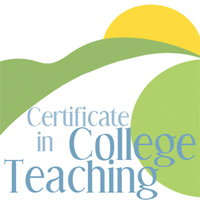 For more information and to register, please see our Certificate in College Teaching webpage. The second program is the Certificate in Humanities Teaching & Learning (CHTL), which is open to humanities graduate students and postdocs. Participants will explore and develop teaching skills that promote learning within a diverse student body across a variety of settings—with an emphasis on the particularities of teaching historically underrepresented populations, including first-generation college students and students of color, and a specific humanities discipline as part of a liberal arts curriculum on small private and/or historically black campuses. For more information and to register, please see our Certificate in Humanities Teaching & Learning webpage.